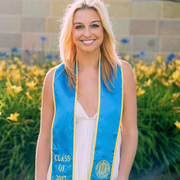 I am a recently graduated UC Santa Barbara student working in Los Angeles as a Legal Assistant prior to beginning law school in August. I am working as a sitter on the side and have been working as a babysitter since I was about 13. I am caring, patient and love working with children! I have experience with picking up and dropping off, preparing meals, creating fun activities and overnight stays. Please message me if you'd like any further information. Jenna doesn't have any reviews yet.